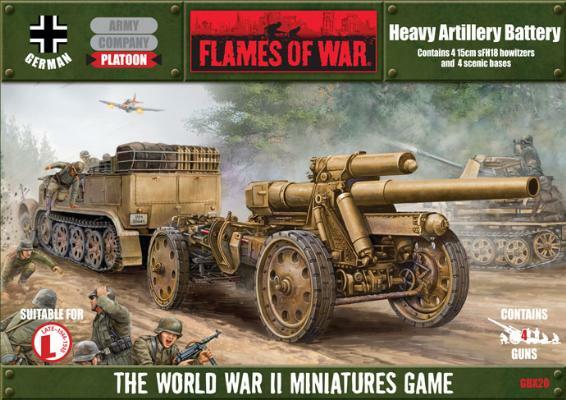 For the third year running, we’ll be hosting a day of armored Flames of War tank battles on Sunday November 22nd, 2015 at noon at Metropolitan Wargamers in Park Slope, Brooklyn. 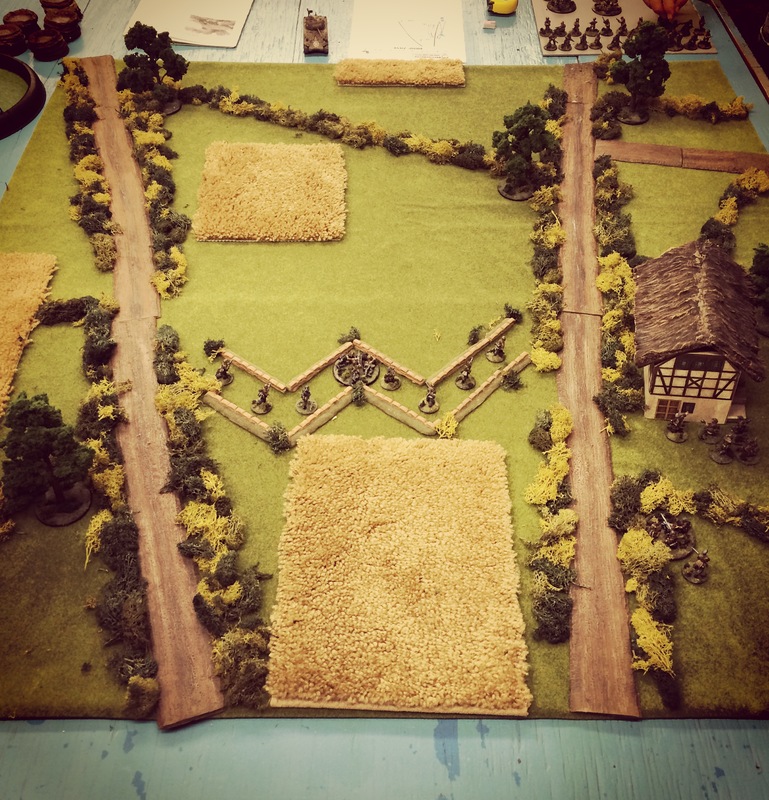 This year we’ll be taking over the entire back room of the club running multiple Late War Europe games using 1900 points of armored forces on a side. 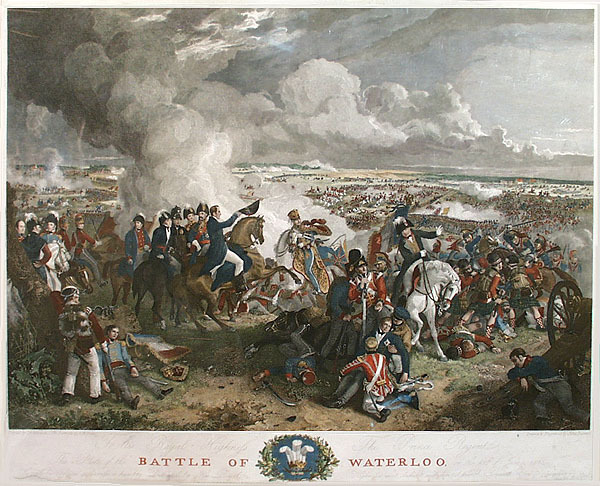 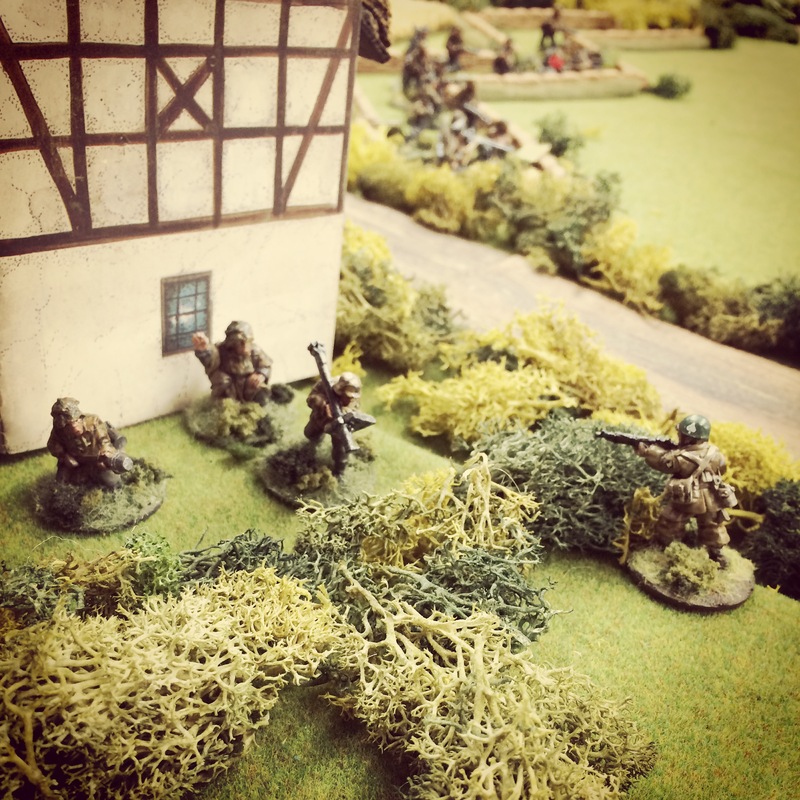 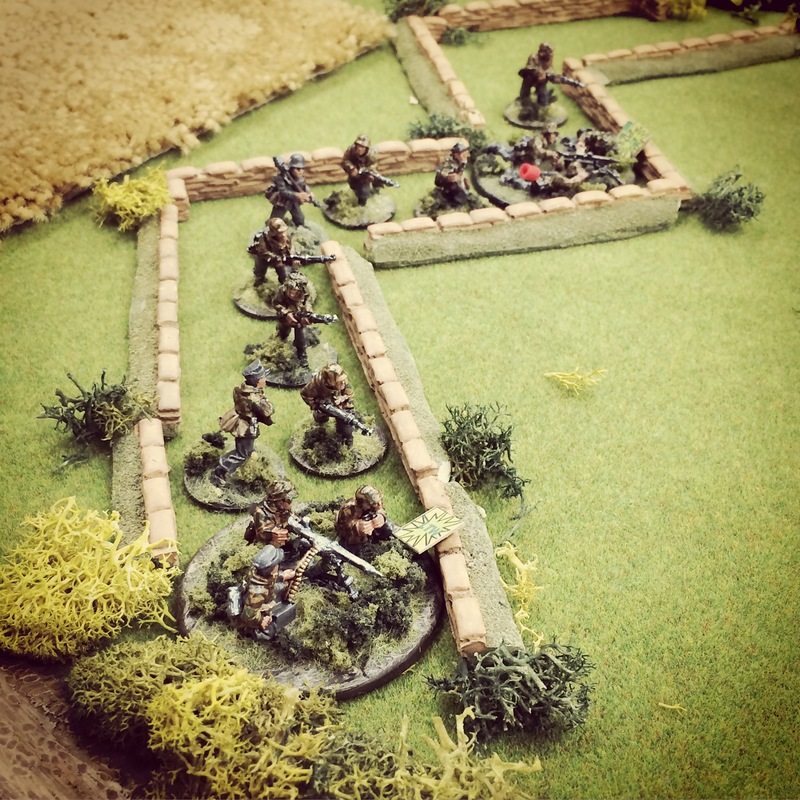 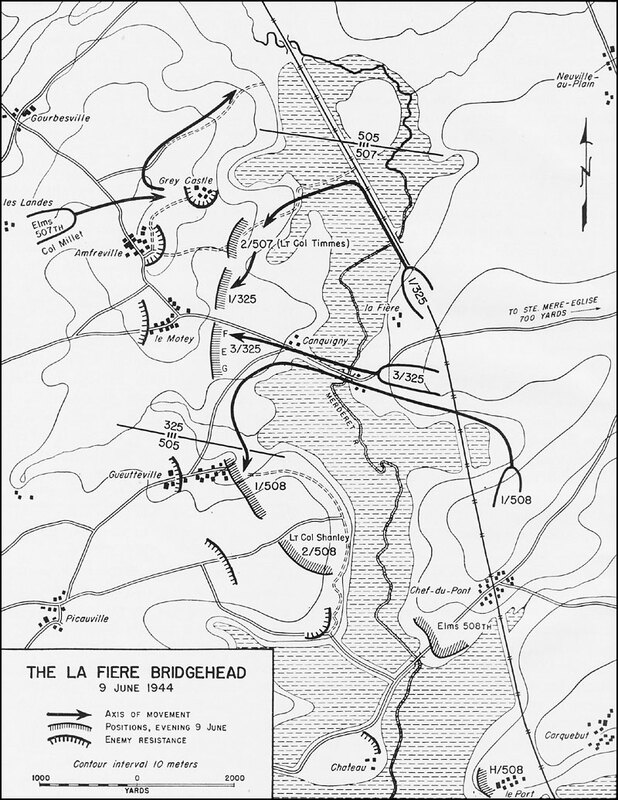 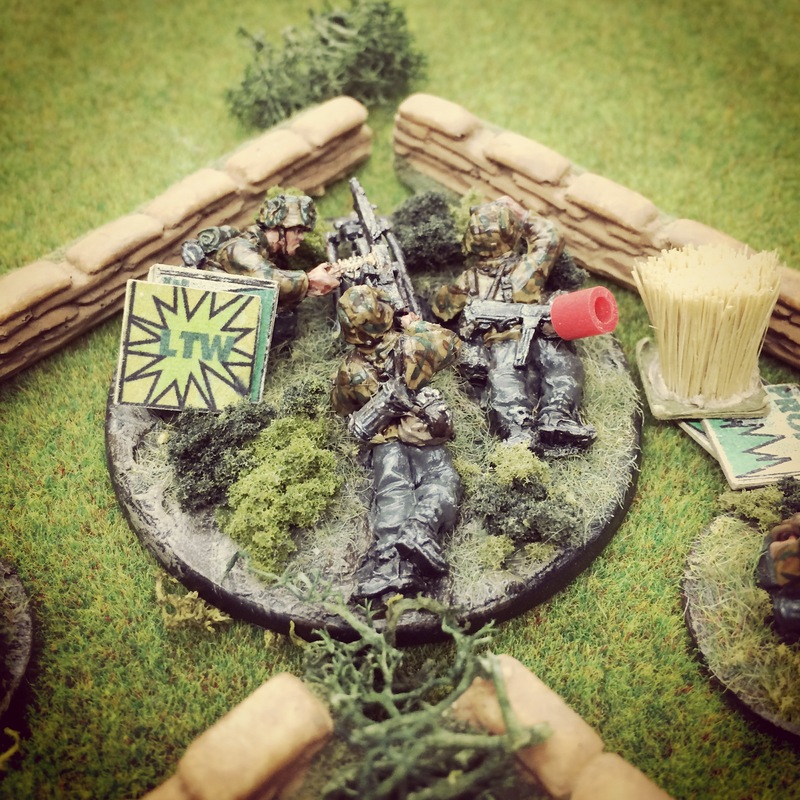 US, British, German and Soviet armies will rolling and fighting on tables filled with beautiful terrain, so experienced players can bring their own forces or newcomers are welcome to just come along, push some armor, roll some dice learn the game. 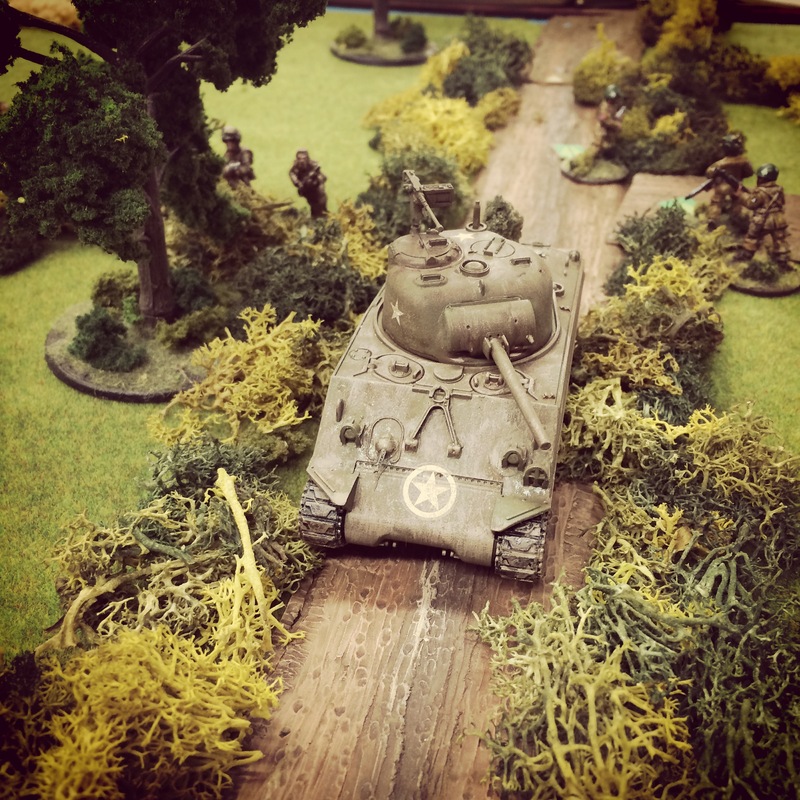 You can check out the photos below from our previous Tanksgiving events from 2014 and 2013, and more photos and after action reports can be found at the links in the captions. 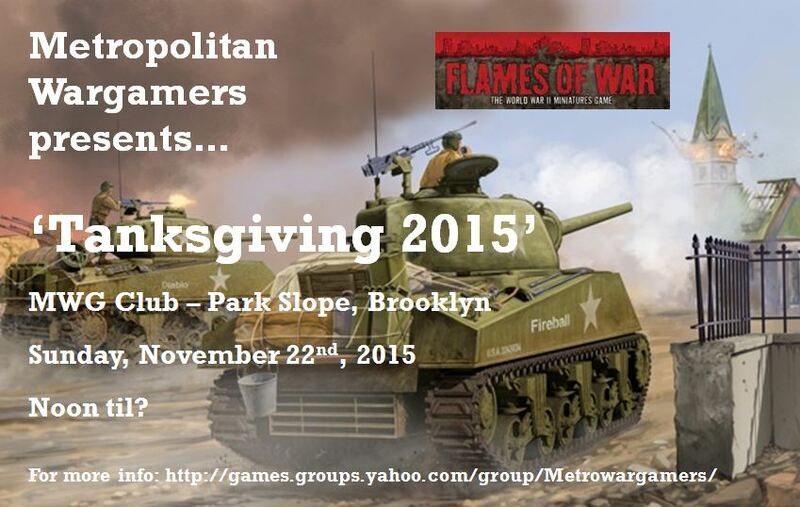 This year’s Tanksgiving 2015 will be held at Metropolitan Wargamers at 522 5th Street in Park Slope, Brooklyn (enter through basement level). 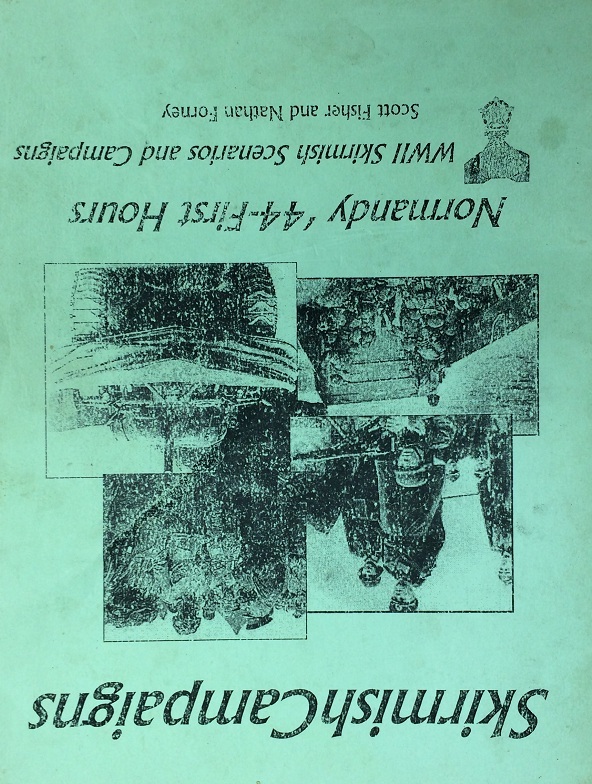 Visitors pay just $15 and regular club members are free. 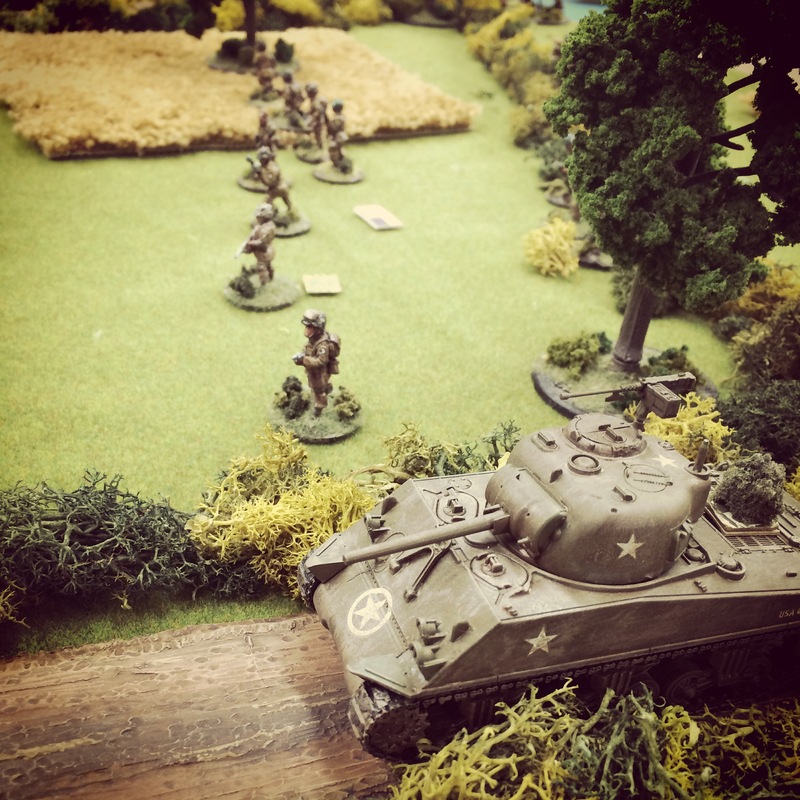 The event will be a great opportunity for new people to meet some of us at the club and experience the New York City’s premier wargaming community. 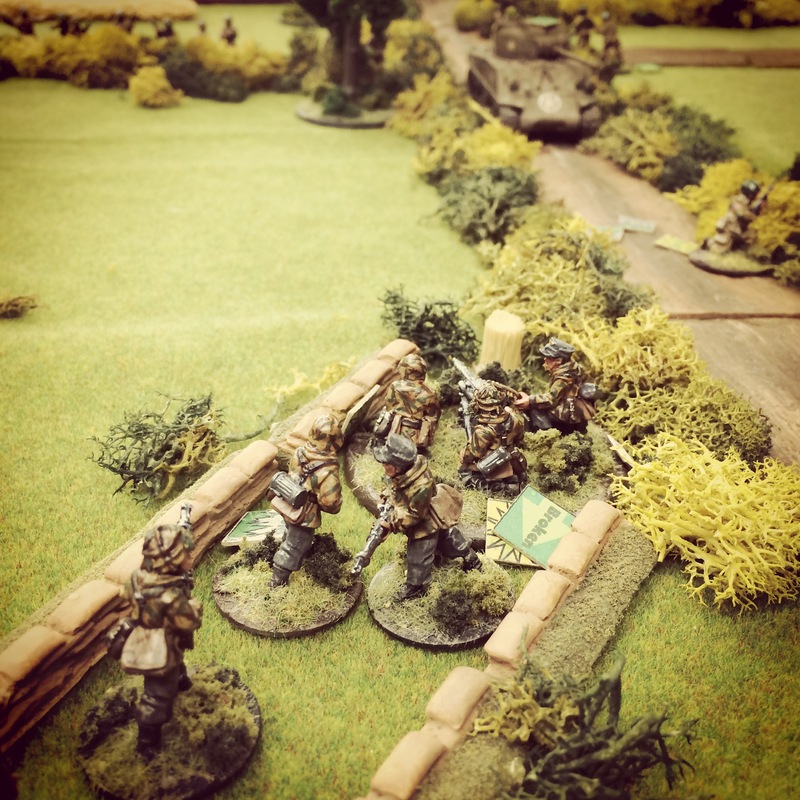 If you’d like to come, RSVP via our club’s Yahoo group. 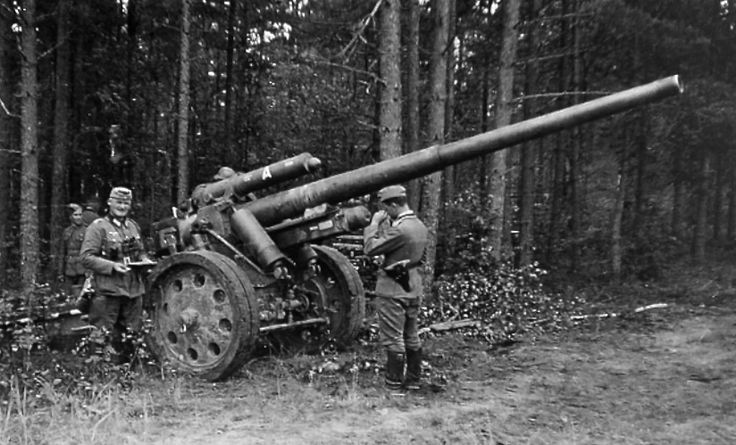 The long-lived and commonly-found 15cm sFH18 howitzer was fielded by German forces from the 1930s and all through World War II. 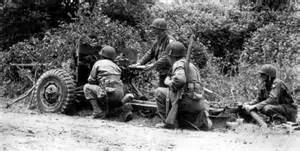 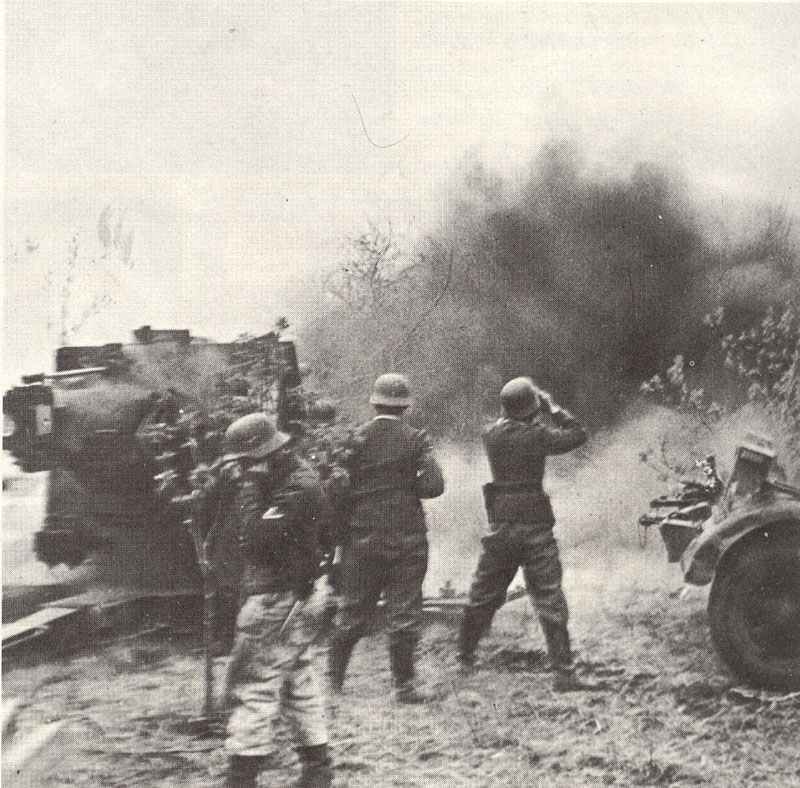 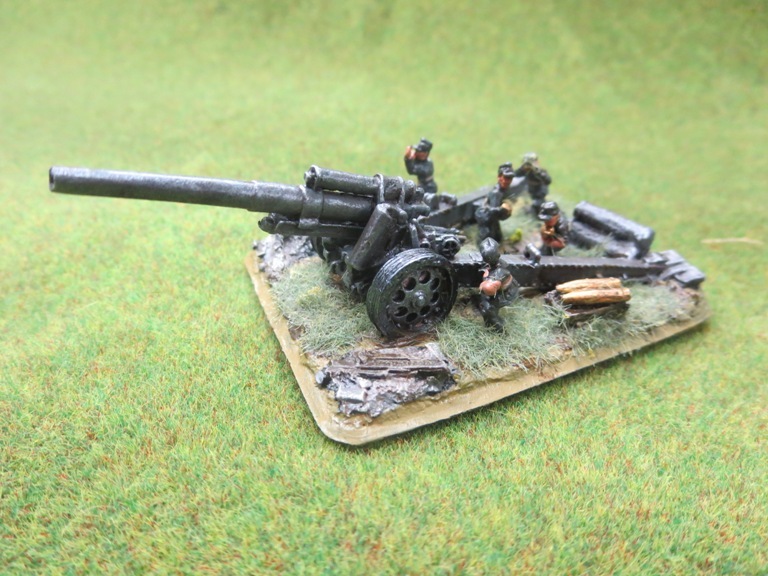 Tough to haul and a lesser weapon than many of the large artillery pieces fielded by Allied forces during the war, the German gun nevertheless went through several wartime design iterations and served multiple nations in post-war decades. 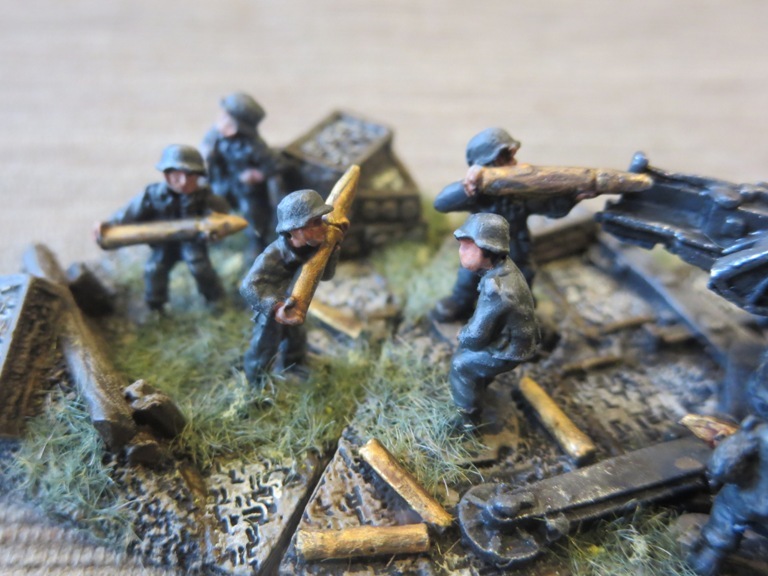 I’ve been in the home stretch of getting ready for my Flames of War Sint-Oedenrode scenario at the upcoming HMGS Fall In! 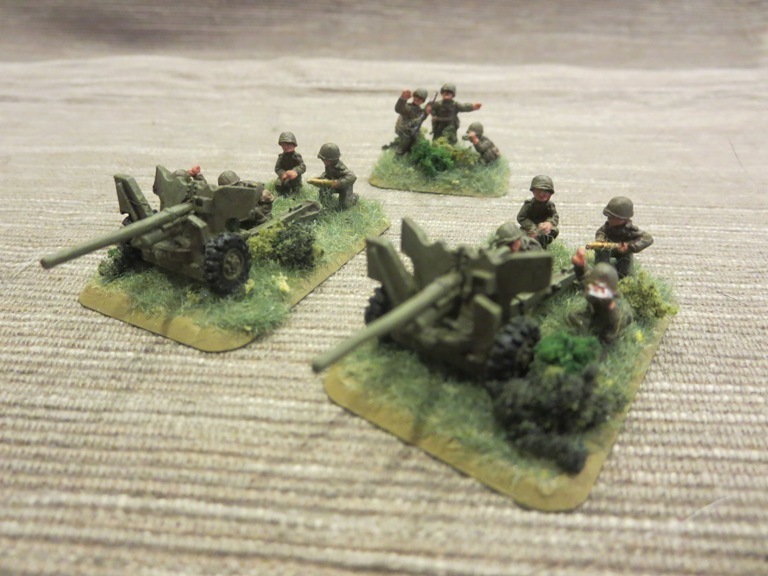 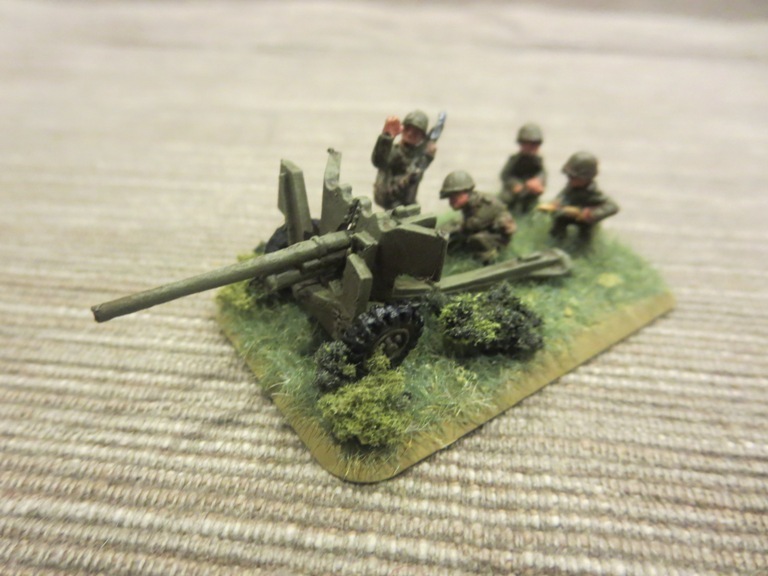 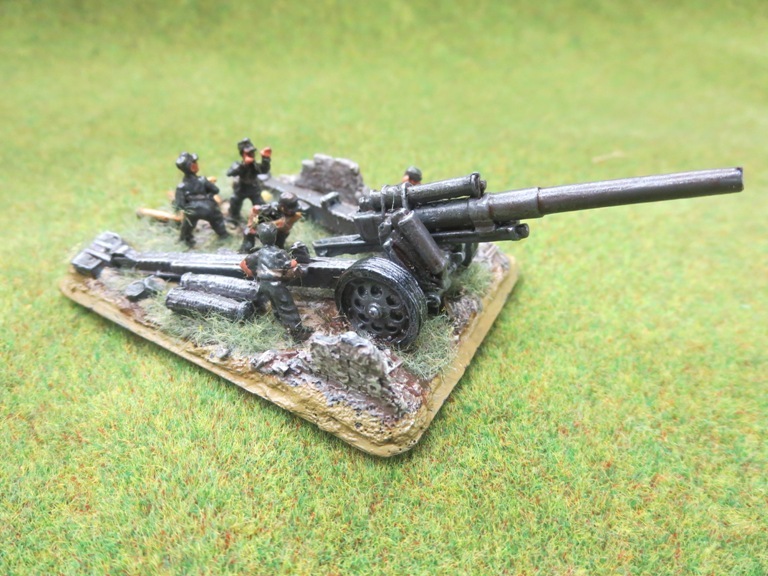 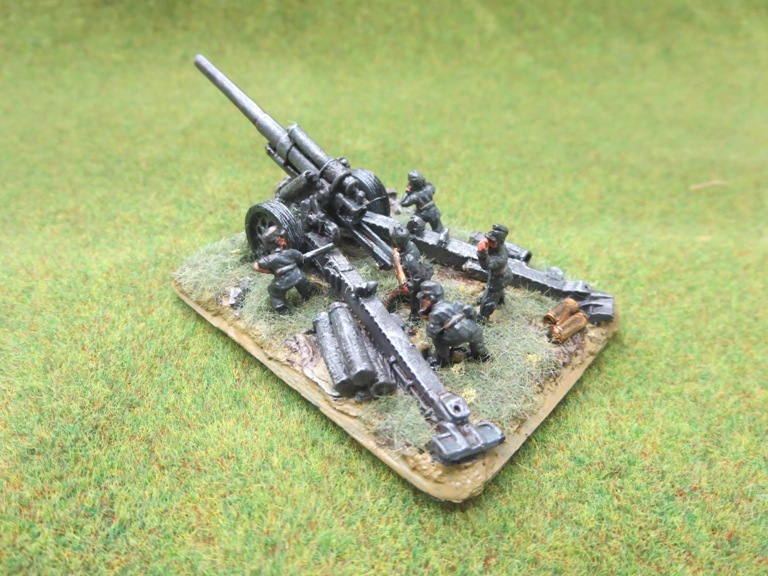 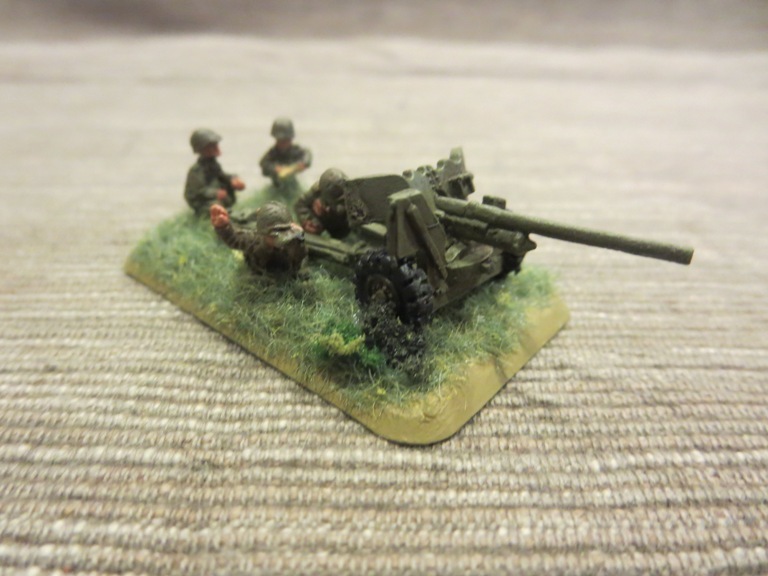 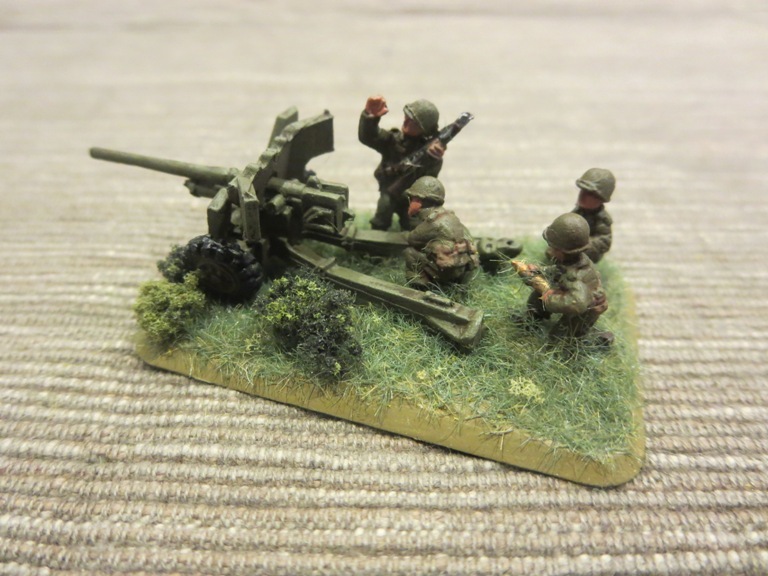 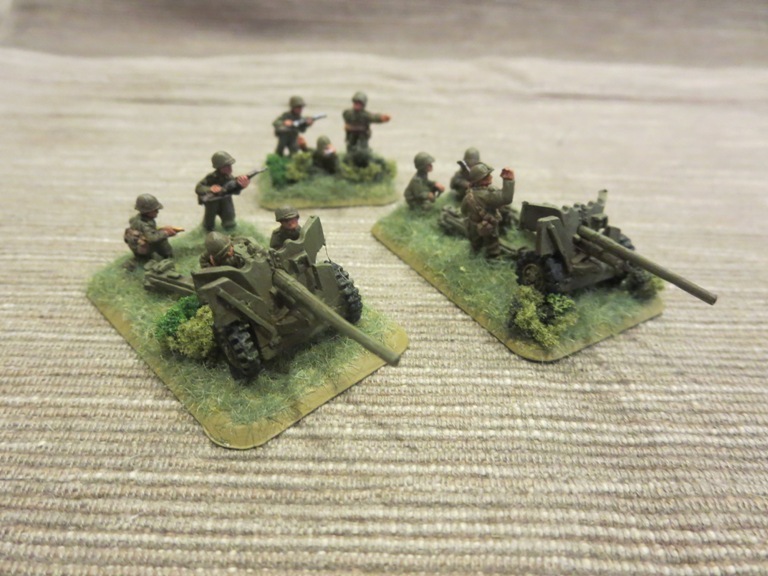 convention, and getting some big German 15cm sFH18 howitzers finished was the last on my to-paint list. 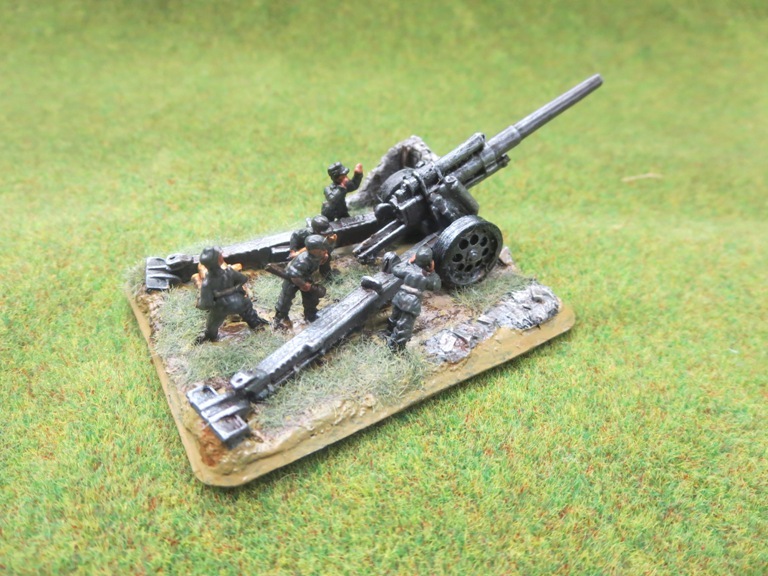 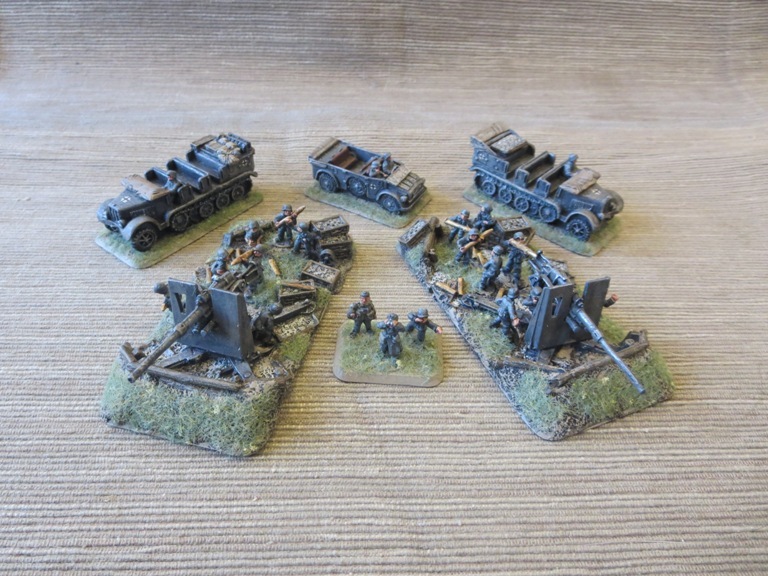 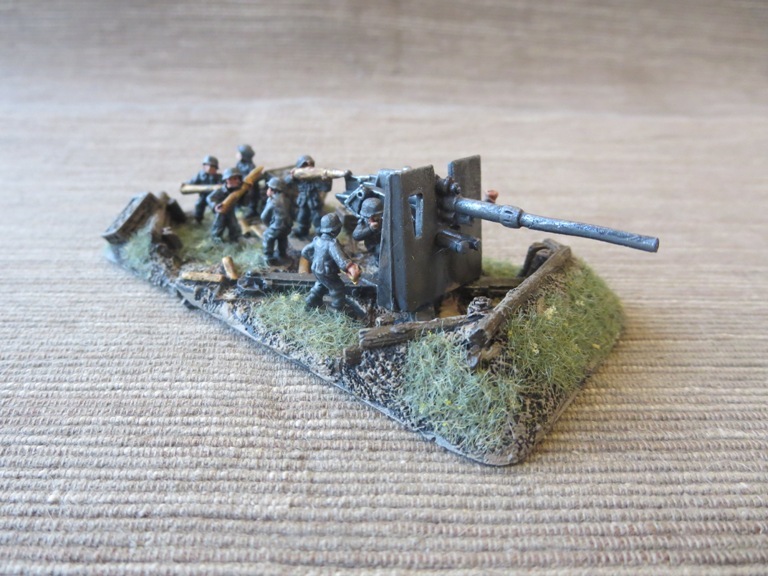 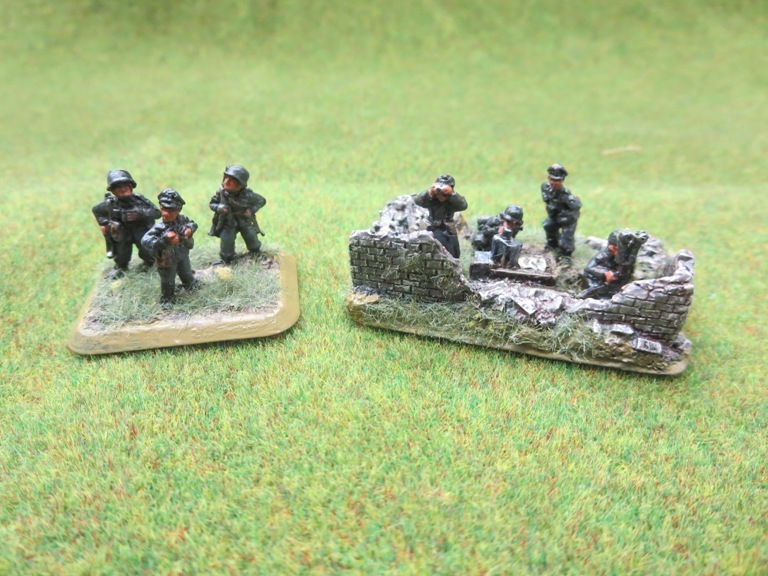 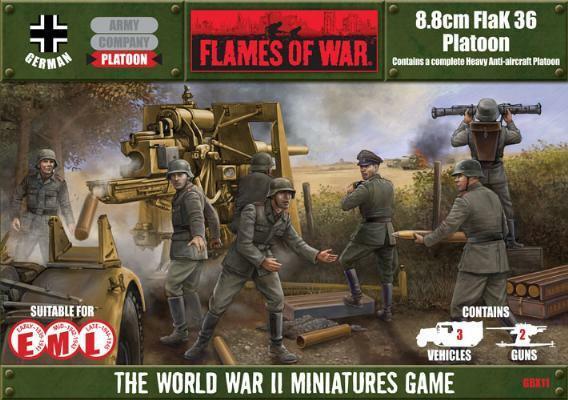 FOW offers a beautiful box set of the German heavy artillery battery, featuring four guns, crew, staff, command, spotting teams and individually-sculpted resin bases. 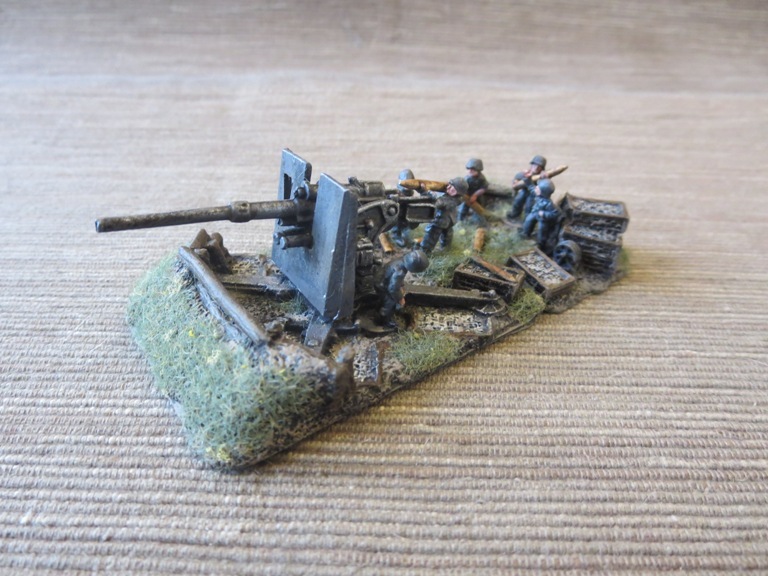 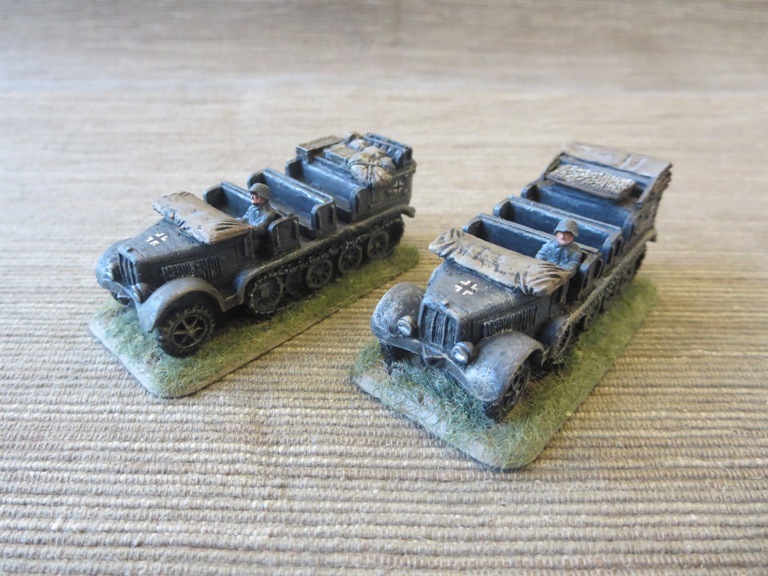 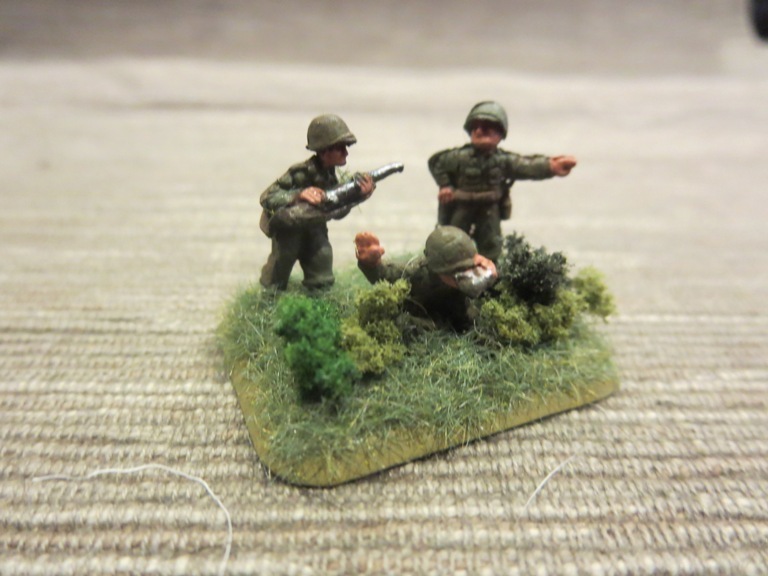 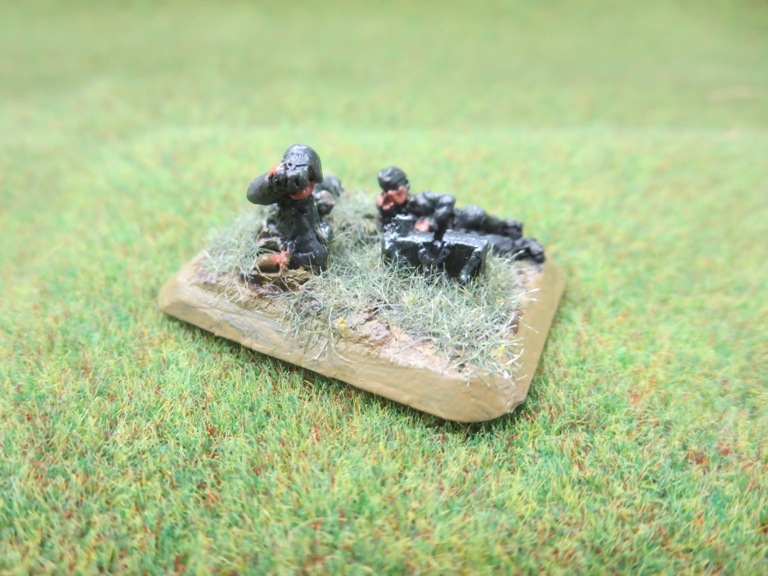 The set of models is a bit pricey, but given the heft of models and their usefulness in so many German army lists, the battery is sure to pay off over time. 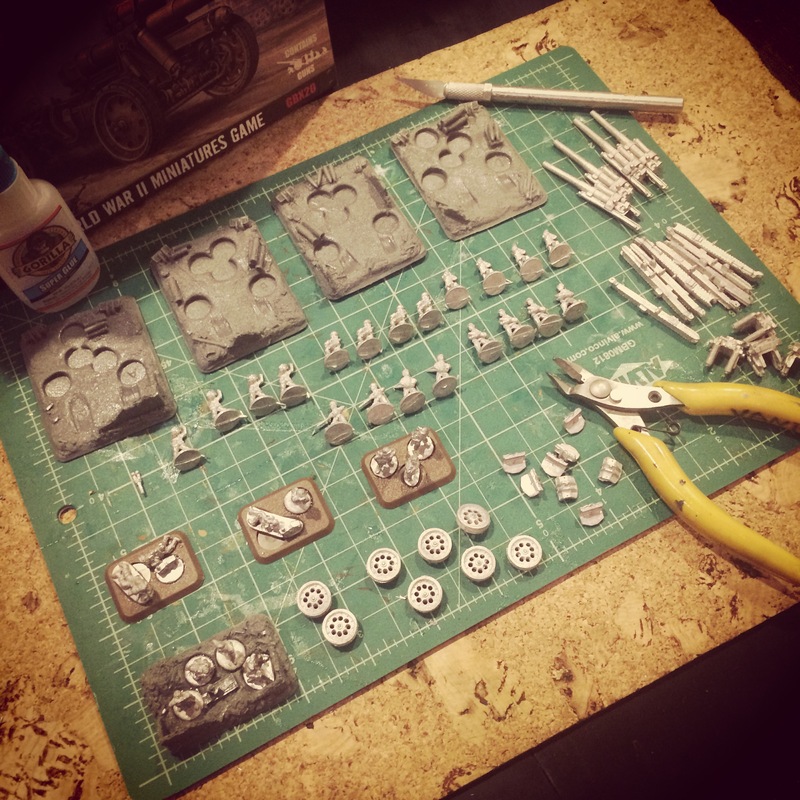 With so many parts in the box, getting organized from the get go is key. 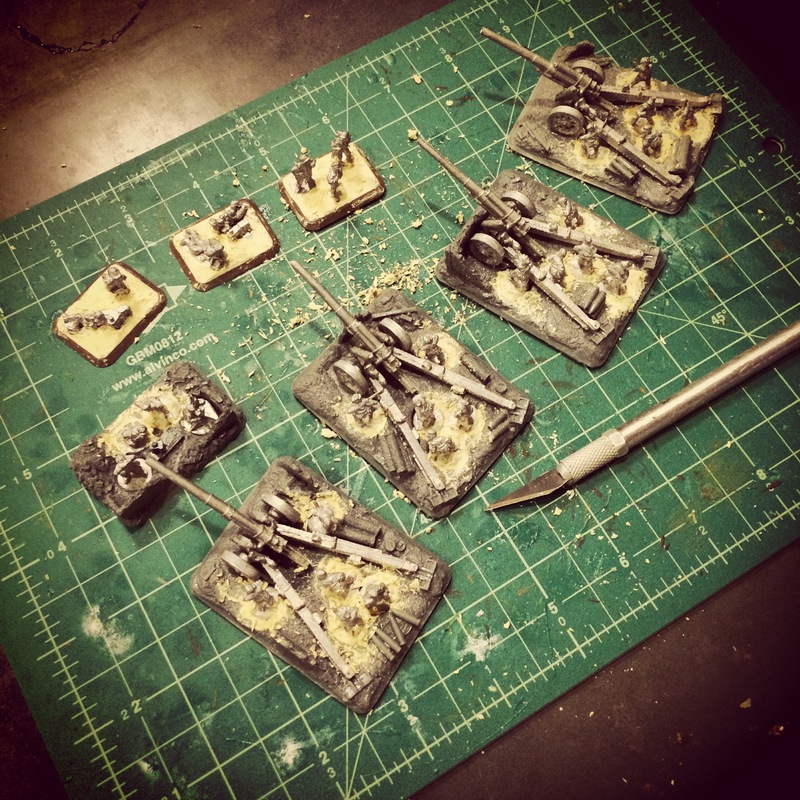 After cleaning up and dry-fitting all the pieces, I get everything glued up. 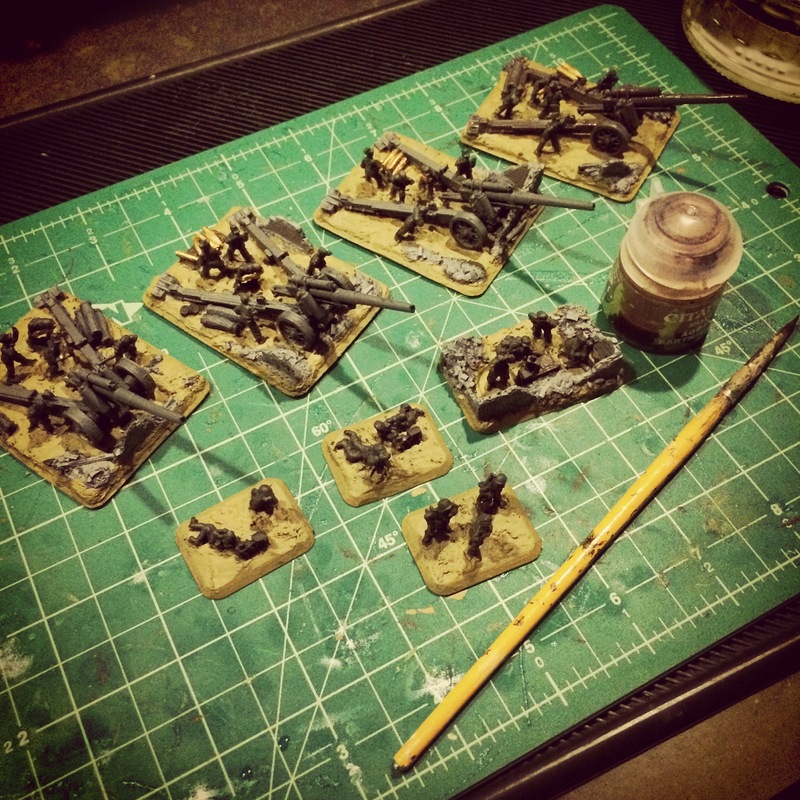 After drying, I use wood filler to cover the spotter and command bases and to also hide any seams where the figures glue into the cast resin bases. 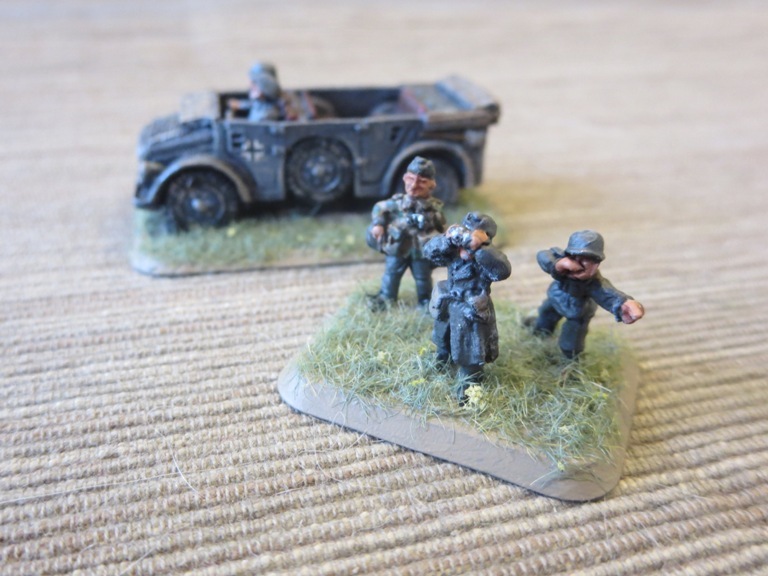 From there, my usual German painting scheme in greys over flat black primer plus other details makes finishing the models move pretty quickly. 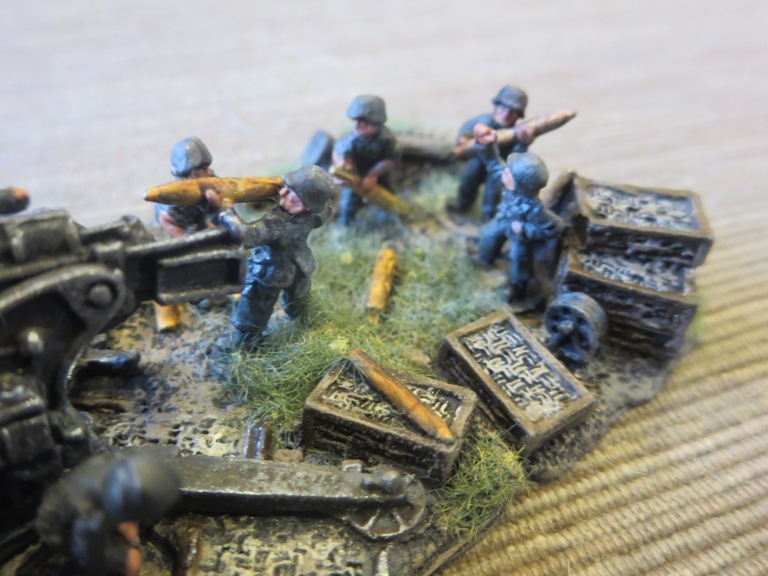 As with most of the big sets of FOW models, the details on the models is a lot of fun. 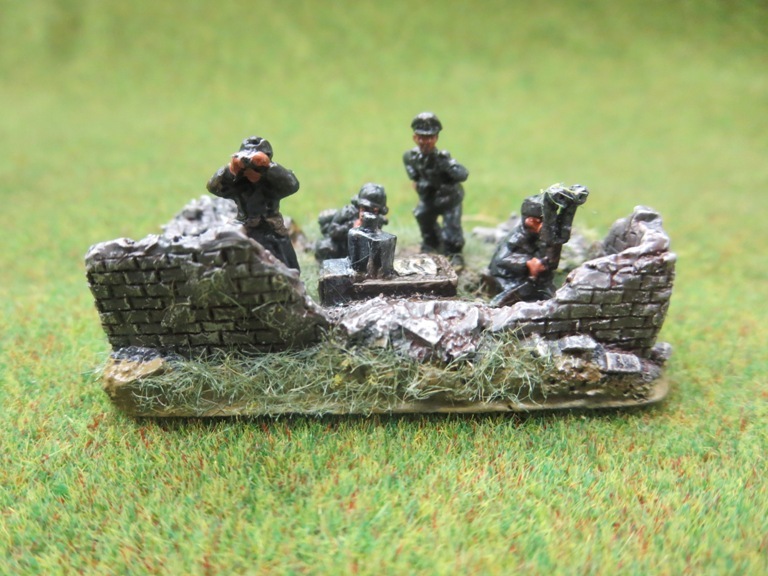 The intensely-posed four-figure vignette of the staff team in their little bombed-out bunker is a new favorite of mine. 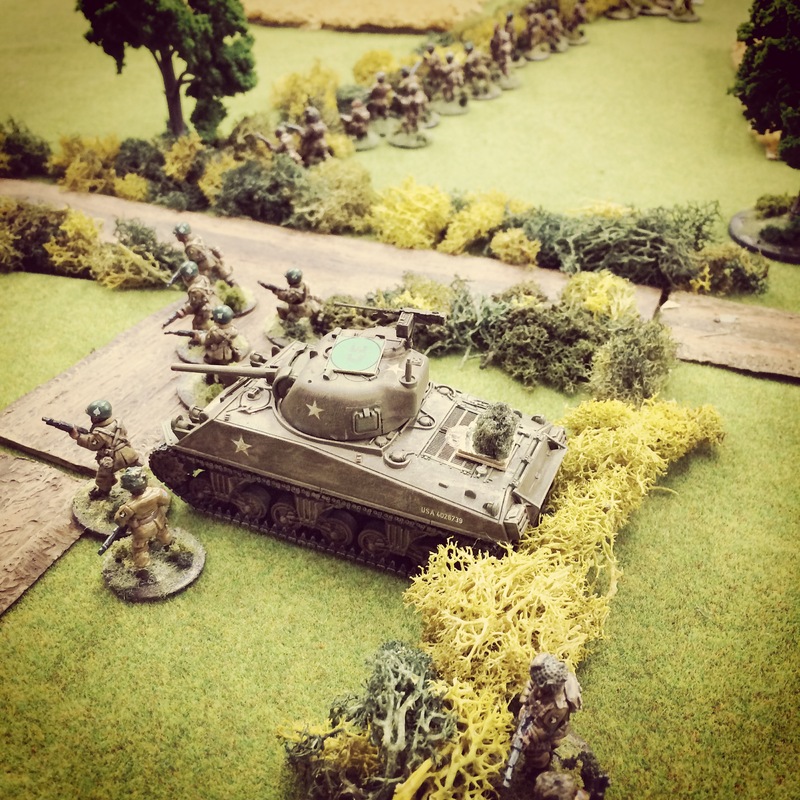 Even with repetitive gun crew figures, each unique base makes the whole battery just varied enough at arm’s length and are certain to make an impact when the Axis next hit the table.